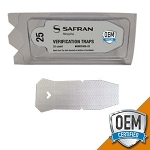 The material used for Rapiscan Systems' (previously Morpho Detection) calibration traps is a high-quality Teflon® coated fiberglass optimized for use in Rapiscan trace detection equipment, including the Itemiser DX. 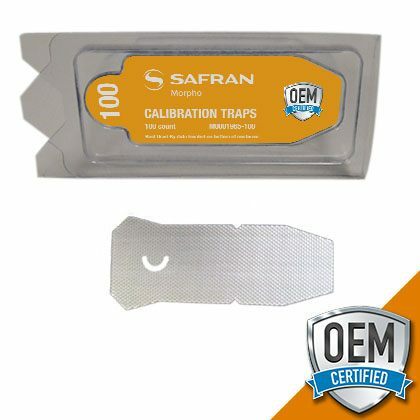 Calibration traps have highly tested and optimized quantities of specific standards embedded onto the surface of the trap under strict laboratory and quality controls in order to ensure the proper functionality of TSA explosive trace detection equipment. Calibration swabs are used in conjunction with Verification Swabs and Sample Swabs and are an integral part of the tool box for professional security equipment. For ease of identification, calibration traps are stamped with the letter "C." Calibration traps are intended for single use only and should be discarded after each use. In order to maximize the longevity of this product, the container should be securely closed immediately after obtaining the required trap. These explosive trace detection swabs come in an easy to dispense 100-count plastic clam shell container and are the perfect quantity for the Itemiser explosive detector in a high use environment.